Spotify has changed the way humans listen to music—for better or worse. But one feature that is undeniably awesome is the Discover Weekly playlist, a curated collection of songs, updated every Monday, which helps people find new artists to love. 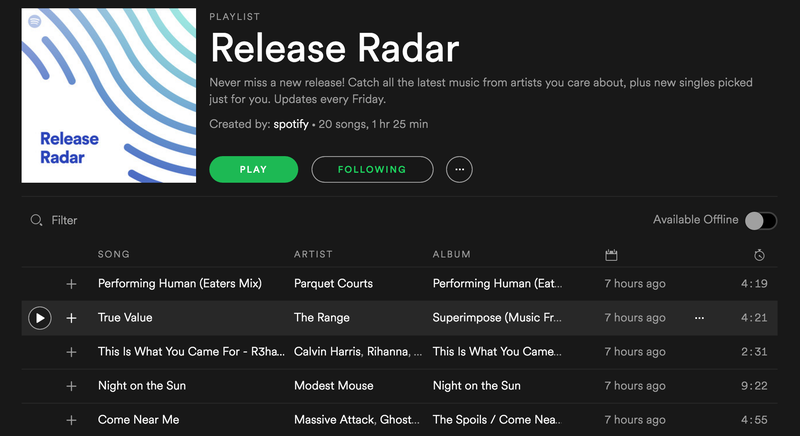 Spotify is now doubling down on this algorithmic bit of magic with a new weekly playlist called Release Radar. In most ways, Release Radar is a direct descendant of Spotify’s much-loved discovery playlist. Like Discover Weekly, it drops every week (on Friday in this case). To find it just go to browse > discover>Release Radar. You can then add to your lists of playlists for easy access. What makes “Discover Weekly” better than other music recommendation algorithms is that it uses real human input. So instead of some cold, calculated machine picking all the songs, Spotify analyzes billions of playlists made by professionals and Spotify users alike, each representing some particular slice of musical taste, according to Quartz. Spotify then analyzes your listening history and categorizes the bands you like very precisely. Rather than simply describing bands as “rock,” an artist would more likely be labeled “low-fi indie folk rock.” Then Spotify’s algorithm kicks in, combining those two pieces of data to create a playlist that does a very good job of predicting what you will like. It works so well in fact, that weird song selections can feel like personal judgments. With Release Radar, Spotify mixes up the formula a bit. After all, these are only new releases, meaning the pool for selecting music is much narrower. So Spotify takes your entire listening history and hunts for releases from the last two or three weeks that match your tastes. Compared to Discover Weekly, my first Release Radar playlist appears to rely much more on my listening history. For example, my playlist is all bands I’ve definitely had intense obsessions with at one time or another. So you won’t see many new faces, which intuitively makes sense. But I have to admit, it’s a pretty great collection of tunes to help usher in the weekend.